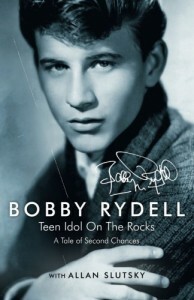 Bobby Rydell, born Robert Louis Ridarelli in 1942 in Philadelphia. One of his first performances was in 1952 in Paul Whiteman's TV Teen Club, he started playing drums at the age of 9, and later performed in 1959 on American Bandstand. He recorded Kissin Time when he was 17. Since then his career took off with numerous records such as the popular Volare, Wild One and Swinging School. He performed on many shows such as American Bandstand, The Perry Como Show, The Ed Sullivan Show etc, and also appeared in Make Room for Daddy and in Bye Bye Birdie with Ann Margaret. The impressive singer appeared on American Bandstand for 33 and 1/3 years. I was born in 1953 so when I was able to recall Mr.Rydell, his career had already taken off. I do remember hearing all of the teen heartthrobs during that time period as my parents were huge fans. So I definitely grew up listening to this music. I absolutely loved Bye Bye Birdie, of which Mr. Rydell appeared. A time when rock and roll was definitely taking off with Bobby Darren, James Darren, Fabian and Frankie Avalon for starters then moving on to Elvis and the Beatles. Amidst health concerns, family dysfunctions Mr. Rydell's career flourished and he is still performing today at the age of 74. Very impressive indeed. I generally don't read a lot of biographies as they can get bogged down in details, but this one was easy to read and interesting and I enjoyed it.